« Spiritual Journey First Thursday: Summer! 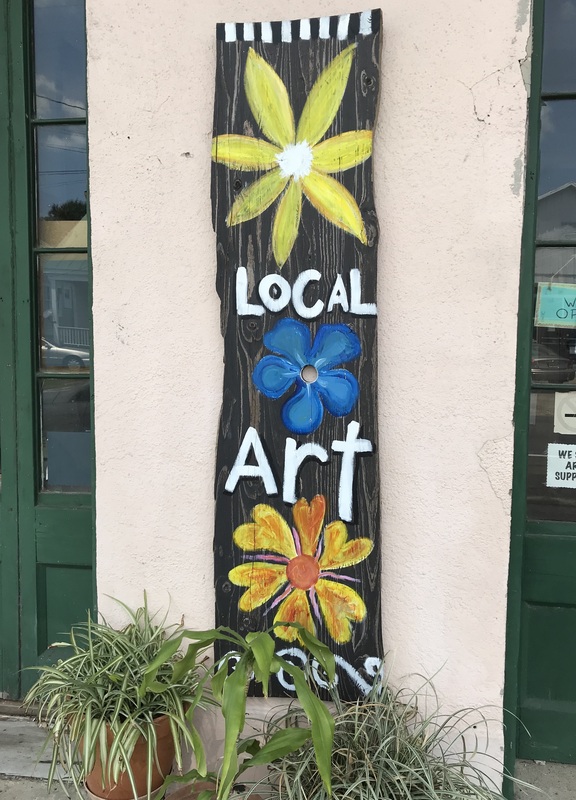 With more time in my day these days, I’ve taken the opportunity to join my friend Marcie while she sits at A&E Gallery, a local co-op art gallery. Marcie is a collage artist. We work side by side on art journaling. She does beautiful work and posts it on Instagram. She is currently working on a Postcard-a-Day project. She posted this beauty. I have full on envy of her talent; nevertheless, I enjoyed her invitation to play with this medium. In January, I started art journaling in a book I made from an old discarded book. Each month I collage a few pages and work on a heartmap. My son-in-law found an old electric typewriter at an estate sale for $15 and gave it to me this week. It’s quite a clunker, but it works. Michelle Haseltine inspired me to do typewriter poems. She’s been writing them every day for a while now. You can see them on Instagram and Facebook. 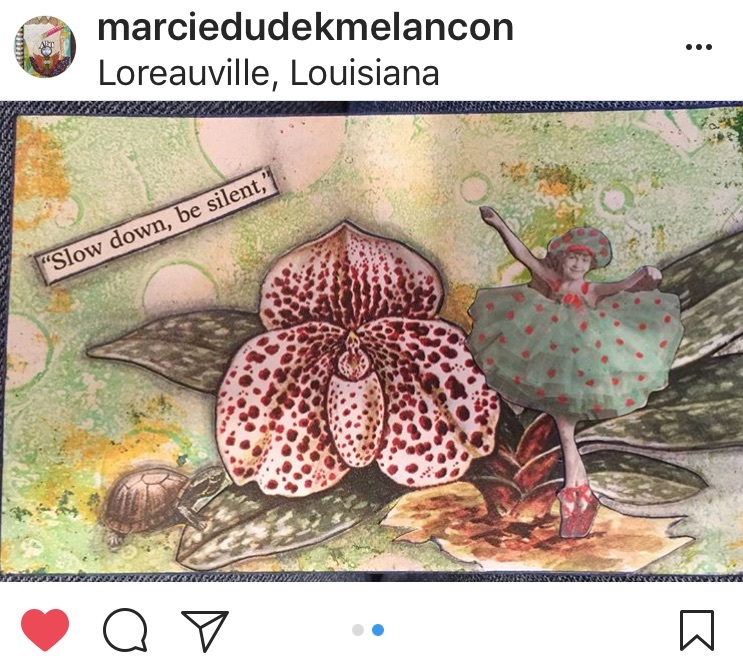 With my art journal, some words and phrases, and a sense of flow, I played with poetry. These are far from any kind of masterful poetry, but the point is to Play! Do this! Allow yourself some open space and freedom. Leave behind the critic and the voice who says you are getting nothing done. Just be present and play! Margaret, this work provides the incentive to play with language and artistic techniques. Thanks for sharing your work and Michelle’s calling to create typewriter poems. How much fun is this. 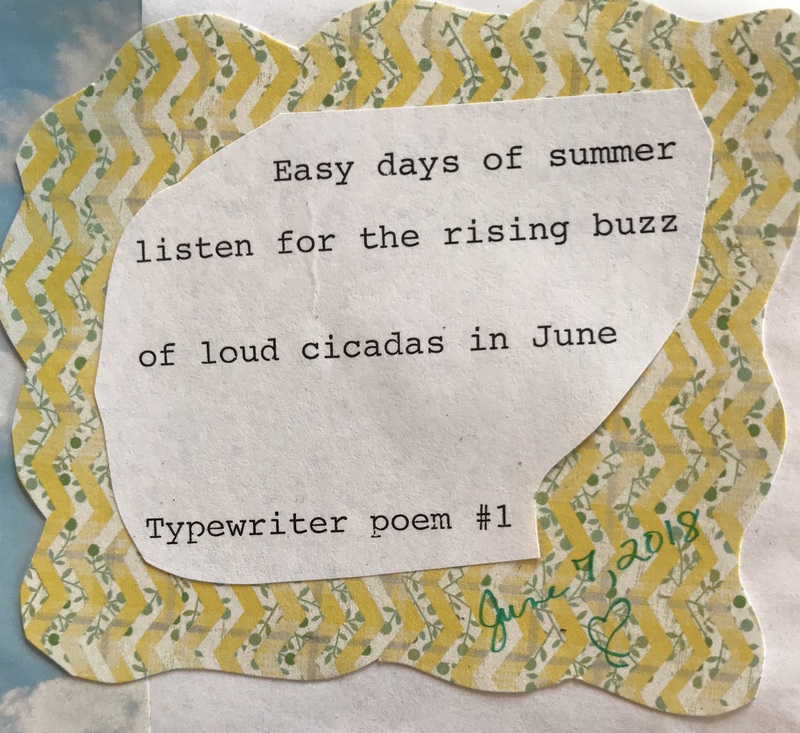 Enjoy your easy days of summer with the incessant cicada songs (I actually miss that sound). This notebook is so beautiful. I just so happen to have a new notebook and summer just started for me today! Wheeeeeeeeee! Maybe we could do a google hang out art journal session. Be present and play! Love your invitation. I’m absolutely terrified of art, but love watching friends who draw in their notebooks. I’ve sat by Linda at conferences & love glimpsing her sketches. The buzz of cicadas takes me back to Texas and Oklahoma. Not sure we have cicadas in Washington. I have two new purse-sized journals set aside to take to Europe. You have reminded me to make sure I pack my colored pencils!! The loud buzzing’s emerging from your poem and the ochre-yellow patterned paper! Rich post Margaret, have fun with your journaling and typewriter this summer! Wonderful advice, Margaret! This looks like a fun project. I like the line, “circular sounds of June,” tucked in at the bottom. Thanks so much for the encouragement to play! I love this advice to play. 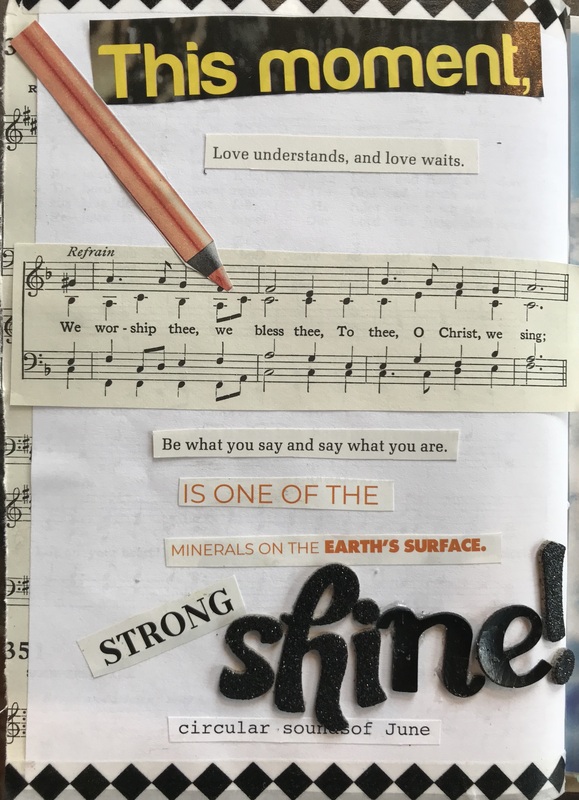 Your typewriter/mixed media poems are lovely! This seems like it would be so fun. I’m going to teach sixth grade language arts next year and want to incorporate lots more visual, so I I’ve been experimenting with Sketch noting this month. This looks like it would be fun to try! Great art and writing project! I look forward to seeing more, Margaret! These are so tactilely appealing, Margaret, and I think it must be very inspiring to sit next to a visual artist while you write. LOVE the way the typewriter poems are coming out. We all need more time to play!